"The Department of Health and Human Services (HHS), in carrying out regulations providing for the replacement of ICD-9 (International Classification of Diseases-9) with ICD-10 as a standard code set, shall provide for a two-year grace period during which physicians and other health care providers submitting claims and other documents using ICD-10 are not penalized for errors, mistakes, and malfunctions relating to the transition to such code set. HHS shall also give these practitioners assistance during the grace period. The Government Accountability Office shall study this transition for Congress." Let me introduce myself. I'm Tom Dwyer, a Subject Matter Expert and Forensic Data Analyst for the 2016 ICD 9-10 GEM Data Exceptions and Anomalies. My Red Raven Productions presentations represent my Didactically Salubrious Subject Matter Expertise in the International Statistical Classification of Diseases and Related Health Problems, 9th revision of the Clinical Modification code set, 10th revision of the Clinical Modification code set, General Equivalence Mapping 2000 thru 2016, including analytics on the Data-Exceptions and Anomalies that will impact occurrences to the Historically Accurate and Auditable Digital Representation of the Medical Diagnosis Provenance for countless Patients and HealthCare. The implementation crisis of the transition from ICD-9 to ICD-10 has the greatest impact on small to medium healthcare provider practices. On many social and professional media websites, the common question raised by these providers concerns the current ICD-10 H.R.4302, SEC. 212 law scheduled to go into effect on 2015/10/01 and what impact the implementation date has on them. Some providers may choose to drop out from Medicare and drop off the HealthCare Payer's "provider list," thus impacting patients. The H.R.2652 will support providers with the ICD-9 to ICD-10 version upgrade. My presentations help explain the ICD 9-10 GEM Data Exceptions and Anomalies in the HHS/CMS/CDC 2016 data so Patients and HealthCare Providers can develop a more informed opinion, and suggest possible courses of action. On 2010/04/27, I attended the CMS "ICD-10 Vendor Conference" in Washington DC and helped to identify issues for a GAP analysis. I would suggest that similar and multiple "ICD-10 Provider Awareness" seminars be organized now, as soon as possible, to help HealthCare Providers understand the ICD 9-10 GEM and avoid the "errors, mistakes, and malfunctions" from any data exceptions and anomalies. On 2012/09/20, I attended a CMS "Healthcare Fraud Awareness Symposium," where I discussed the possibility that the data exceptions and anomalies would increase the chances of an increase of more false positives from Providers' "errors, mistakes, and malfunctions." On 2012/09/21, I attended a CMS live activity entitled "ICD-10-CM: Preparing for a Successful Implementation," where I discussed the "errors, mistakes, and malfunctions" from data exceptions and anomalies that may impact the participants. The 2015/06/04 H.R.2652 Bill hopes to alleviate the problem and not penalize HealthCare Providers for any "errors, mistakes, and malfunctions relating to the transition" and promises to provide them with assistance during the two-year grace period. What forms that "assistance" will take are yet to be determined. A GAP analysis "STUDY" is necessary and proposed in H.R.2652. My Red Raven Productions Presentations will help give HealthCare Providers the proper overview of the data exceptions and anomalies to help mitigate the impact to the Historically Accurate and Auditable Digital Representation of the Medical Diagnosis Provenance for countless Patients and HealthCare Entities. My Red Raven Productions website will assist in ICD-10 implementation by supporting the "STUDY" committees and groups, thus helping to formulate actual public education incentive grants like the "Meaningful Use" TITLE IV of The American Recovery and Reinvestment Act (ARRA). The great majority of HealthCare Providers with whom I have discused this with are still unaware of the ARRA and can not find information or application forms for the "meaningful use" program. They have numerous concerns relating to the upcoming 2015/10/01 deadline date and how they will be impacted. 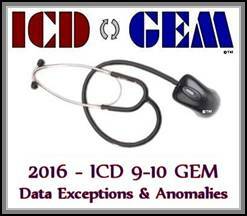 HHS 2016 downloads include a number of changes and updates, so as we go forward I caution Patients and HealthCare Providers to become aware of the 2016 ICD 9-10 GEM Data Exceptions and Anomalies. Please enjoy my "Multimedia-Video-PDF" presentation and let's open a discussion for debate. NOTICE: Mr.Dwyer/RedRavenProductions©™ is the proprietor of all copyright in a literary-artistic-musical work entitled "ICD-GEM" & "ICD 9-10 GEM" (International Statistical Classification of Diseases and Related Health Problems, 9th revision code set to the 10th revision code set General Equivalence Mapping) Manager-SuperBill-Loader (The "Work"). Mr.Dwyer/RedRavenProductions©™ has reserved all rights in the Work. Initial concept, design and development of the "ICD-GEM Manager©™" began in 1997 and was expressed in material form on March 2 2000. Mr.Dwyer/RedRaven Productions©™ reserves all rights under 17 U.S.C. Section 101 et seq. and any infringement on these rights could be liable for statutory damages as high as $150,000 as set forth in Section 504(c)(2) therein.